I have a insane ability to imagine every conceivable “wrong” that can occur in my life and my blood pressure responds accordingly. This natural hard wiring plus the high pressure of “type A” Northern Virginia and raising four teenagers means I had an intimate relationship with anxiety and sleepless nights. With all the demands that face us, I bet most of you can relate to struggling with stress and trying to calm your mind and relax your body. 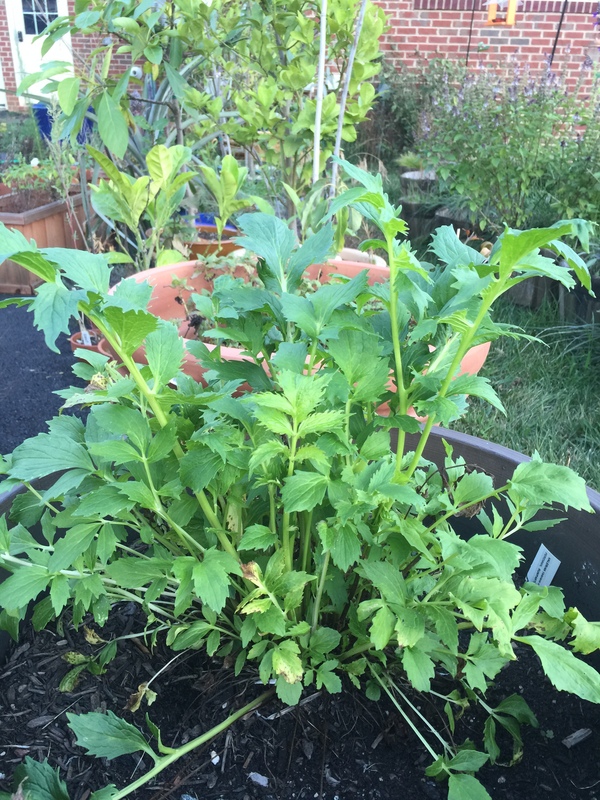 I was incredibly grateful to discover a healthy, non addictive, anxiety remedy/sleep aid that is all natural and easy to grow/make. With a small dose of Valerian root tincture I feel my body relax; and, my mind releases it’s stress and worry. I am soothed and calmed. With a larger dose I can totally relax and fall into a gentle and restful sleep. Even better I don’t wake up with a “sleep aid hangover.” As a final bonus, Valerian even helps with digestive problems associated with stress and strengthens the heart. What an amazing herb! Valerian (Valeriana officinalis) has been used safely for almost three thousand years. It is non addictive, non habit forming, does not “build up” in the body, and has undergone multiple studies confirming it’s safety and effectiveness. However, for a very small number of people (roughly 5%) Valerian has the exact opposite of the desired effect. For this small subset of the population Valerian can be energizing and create restlessness or agitation. If you are in this group you will know after the very first dose. Don’t worry. . .it won’t hurt you. . but you may want to consider another remedy such as lemon balm tincture instead. If you are in the lucky 95%–congratulations! You are about to experience spa like calm, tranquility and soothing relaxation. For an even stronger medicine, Valerian can be combined with lemon balm but I digress. . .
Often roots are decocted–basically boiled–to extract the medicinal components but Valerian is an exception. This root is rich in volatile oils that would be destroyed by boiling. Instead, Valerian should be prepared as a tea, tinctured, or made into capsules. The one negative to Valerian is undoubtably it’s smell which is why I prefer to take it as a tincture or capsule. The smell is shockingly strong, pretty foul, and, has been compared to sweaty gym bags, musty horses, and worse. Just to give an idea, when I was finishing my last tincture my children came into the garage and even before entering the house they were dramatically overtaken by screams, gags, and exclamations of “Did something die??? ?” I have never seen them so enthusiastic to run upstairs and begin homework. Fortunately, the smell soon dissipated and I could enjoy our medicine’s soothing effects–which was much needed after all those screams. 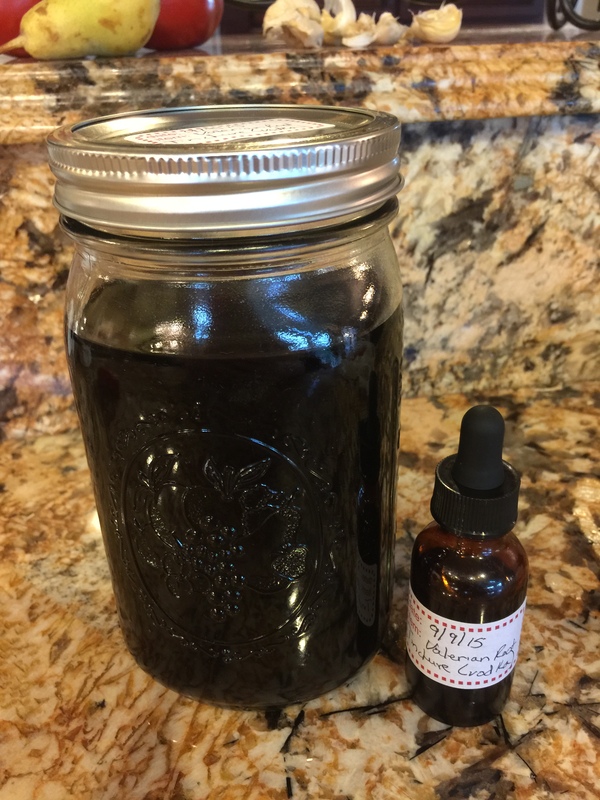 If you would prefer to purchase my Valerian Root Tincture please click here. About 4-6 oz of dried Valerian Root. I prefer to grow my own. This way I know exactly how it is grown, that no pesticides/chemicals have been used, and that it is harvested/dried well. It is a delightfully easy perennial to grow; so, once you get a bit going you can continue to make your medicine every year. However, you do need two year old roots for the best medicine which means a purchase is necessary for at least the first year. 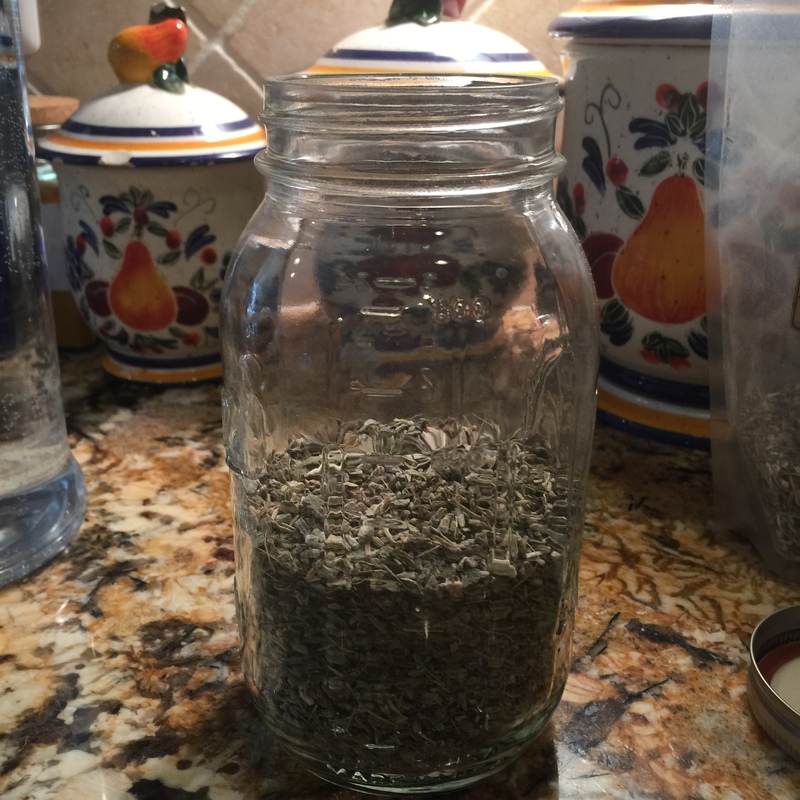 I have ordered from Mountain Rose Herbs with wonderful results. Click here to purchase Valerian root. Solvent of choice. Your options are 80-100 proof alcohol (such as vodka/gin/brandy), food grade vegetable glycerin, or apple cider vinegar. I prefer alcohol because this solvent makes the strongest medicine due to superior extracting properties. However, for children or those sensitive to alcohol a good choice is vinegar or glycerin. It won’t be as strong but it will still be very effective. Vinegar will be stronger than glycerin but glycerin will be sweet–an advantage when children are involved. If glycerin is chosen it should be mixed with water in a ratio of 1 cup water to 1 cup glycerin before adding to jar. If using vinegar–warm (don’t boil) it first. The warming helps to release the medicine in the herbs. Simply fill your jar about 1/3 full of Valerian root and cover with solvent. The pictures above are from an Echinacea Tincture I made. I did not have this blog started when I started my Valerian so I am including these for illustration. You want your solvent to be 2-3 inches above the root. Some of the root may float to the top. If this happens don’t worry they will settle over the next day or so. Put your lid on and shake. I like to say a small prayer and envision peace, calm, and healing being drawn from the roots. Since I talk to my plants in the garden I usually also thank them for the healing energy coming into our families medicine chest. Hold the teasing. . .I get enough from my family. . .lol!!! Your jar should be placed in a cool dark area–but where you will see it so as not to forget to give it some attention. Check it the first couple of days and top off with more solvent if there is no longer 2-3 inches above the roots. Roots swell a shocking amount so it is very likely you will need to top off. Ideally, you will shake your jar every day. This helps to distribute the roots and mix with the solvent to bring more beneficial components from the herb. It is also a wonderfully magical time of connecting with the medicine you are helping to bring forth; and, ts simply fun! After 4-6 weeks your medicine is ready. However, you can leave it longer. The longer you wait the stronger the medicine. Once ready, simply strain out the solid root by pouring the mixture over a cheesecloth covered glass bowl. Don’t forget to squeeze the solids in the cheesecloth. There is a lot of medicine that resists leaving its original home; and, a good squeeze can encourage it to relocate. After extracting as much as you can the spent herbs make fantastic compost. Pour your results into a clean jar and some into a dropper bottle for use. Refill as needed. An alcohol tincture can last many years if stored away from light and heat. Vinegar tinctures can last a year and glycerin 2-3 years when stored properly. Finally, don’t forget to label with “Valerian tincture,” the date it was made, and the solvent you used. Many tinctures look similar after bottled and it is very frustrating to not remember what it is after the work is done. 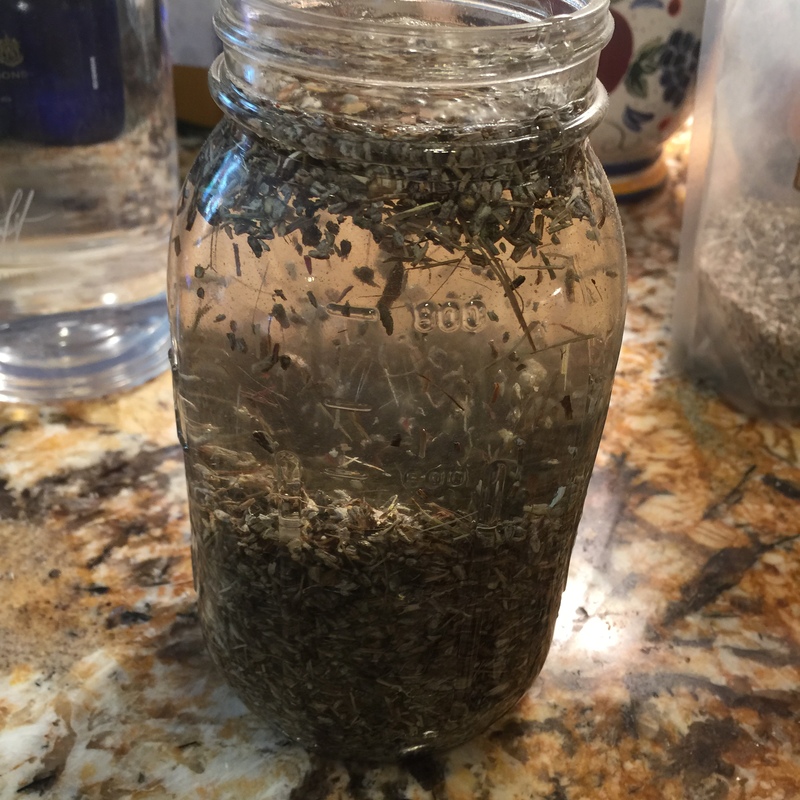 The pictures above are of my finished Valerian Root Tincture. Before taking any herbal remedy/supplement you should always check with your doctor to make sure there are no issues. Each person’s health is very unique and I am not a doctor. Even though Valerian is a very safe herb, you should always make sure that it won’t be a problem for your unique health issues or interfere with any needed medications. It is really pretty difficult to “overdose” on Valerian. One noted herbalist, Rosemary Gladstar, has recommended simply taking enough to feel relaxed. If you get a “rubbery leg” feeling it is time to cut back. However, I have also read several reputable sources that recommend no more than 5 dropperfuls a day (which is about one teaspoon). For this reason, I am keeping my recommendations to 5 or less droppers a day. That being said. . I have taken more with no ill effects. If you are trying to address anxiety/stress you can place 1-1 1/2 full droppers of tincture in warm water or a cup of tea. A cup of tea with honey is my favorite. This may be done three times/day as you feel stress creeping in. For deep sleep you can place 2-3 dropperfuls in warm water or hot tea about an hour before bedtime and follow with another dropper or two immediately before going to bed. I like this method because I gradually relax and by bedtime I am happily in my “Zen state.” However, if time is your enemy you can also take your full dose about 15 minutes before you want to rest. For both conditions you should take Valerian for 3 weeks then stop for 1 and resume. This is to give the body a chance to “reboot” and makes the medicine more effective. Here’s to a peaceful heart and restful sleep! Enjoy! ← Post Labor Day Sale–15% Off Of Naturally Elegant Organic Moisturizer!! !